Celebrating Christmas in Germany is a special treat — and in Dresden, visitors will be able to experience one of the country’s oldest Christmas markets as well as a variety of holiday traditions. If you find yourself in Germany during the holiday season, here are a few ways to experience Christmas in Dresden. Dresden is home to one of Germany’s oldest Christmas markets. 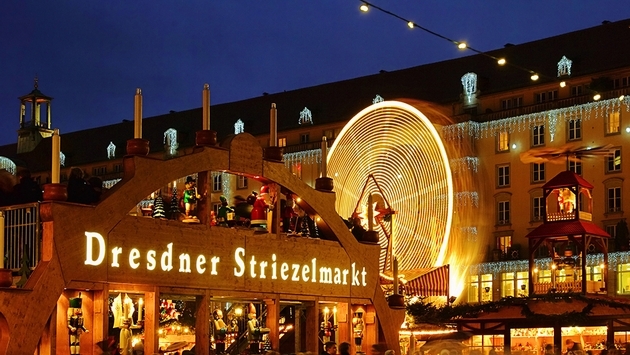 This year will mark the 582nd Striezelmarkt at the Dresden Altmarkt square, which spreads for a mile with twinkling lights and holiday cheer. While the original Christmas market is one of the oldest, there are 11 smaller, more specific markets that have blossomed over the years such as the charm of Huttenzauber or the Romantic Christmas market. The smell of baked apples extends for more than a mile from the main rail station and across the Elbe River. Tours of the markets can be organized and include some of the top markets in the city as well as a stollen bakery demonstration. During the Advent, visitors can take a walking tour of the city with DresdenWalks. Guests get an overview of the historical city as well as learn about the area’s history, with amusing stories of Christmas traditions. Fans of Christmas stollen are in for a treat. Baking demonstrations are a big part of a visit to the city during the holiday season and several restaurants and bakeries welcome visitors to learn the history of stollen. Visitors can join a tour that follows in the footsteps of the baker, who tells stories about the popular Christmas treat along the way and provides visitors with samples and a holiday beverage. Those headed to Dresden can experience the season with a combination of a Christmas walking tour of the city of Dresden and an organ concert at the Cathedral of Meissen. The experience includes an English-speaking guide who takes guests through the city as well as the cathedral followed by the concert and a reception with mulled wine on the rooftop.